Bodyblade is unlike any other piece of exercise equipment on the market today due to the scientific application of low level vibration and inertia. Bodyblade rapidly changes directions at a rhythm of 4.5 cycles per second, which translates to your body reacting 270 times per minute to resist the forces of the blade moving back and forth. What this means is that your body becomes the machine and the Bodyblade becomes your exercise partner. The harder you push and pull on the blade, the greater the oscillation or flex in the blade, which requires greater force output from you to neutralize the speed and movement of the blade. You have to start, stop and change directions of your own body while controlling your mass. This wonderful equalizer automatically adjusts to each one of us. The same blade in the hands of two different people will produce a workout perfectly matched to the individual’s size, strength and muscle endurance. Bodyblade pioneered vibration and inertia training in 1991. With its innovative design, it was created to address the deep dynamic stabilizers of the spine and to provide a stable platform for all other rehabilitation, sport performance training, fitness enhancement and personal training regimen, resulting in improved wellness, core strength, balance, function and muscle definition. Bodyblade strengthens muscle groups throughout the body by varying the positions of the body or direction of the flexing blade. Bodyblade trains movement through muscular teams and patterns rather than isolated single plane muscles. This is what makes it such a valuable tool for rehabilitation, performance sports training, fitness, functional wellness, improved balance, and coordination. Inertia in the Bodyblade also helps the body to become more efficient at agonist (one side of joint)/antagonist (opposing side of joint or action) activities as it promotes a better balance between muscle acceleration and deceleration on both sides of the joint resulting in enhanced coordination, flexibility, posture and efficiency of muscle function. The unique, oscillating action makes it an ideal choice for treating acute injury, chronic disability and post-surgical rehabilitation in a variety of environments and task-oriented activities. Bodyblade tends to normalize the way in which the joints function, eliminating the potential for imbalance that can occur with other exercise systems. It also permits a high efficiency of motion, producing the greatest rehabilitation gains with the least amount of effort. - Smooth and variable resistive workout. Automatically adjusts to the fitness level of the user. Challenges every major muscle group. - The original and authentic Bodyblade created by physical therapist Bruce Hymanson. - Lightweight and portable - travels anywhere. Weight: 1.5 lbs Length: 4 feet. 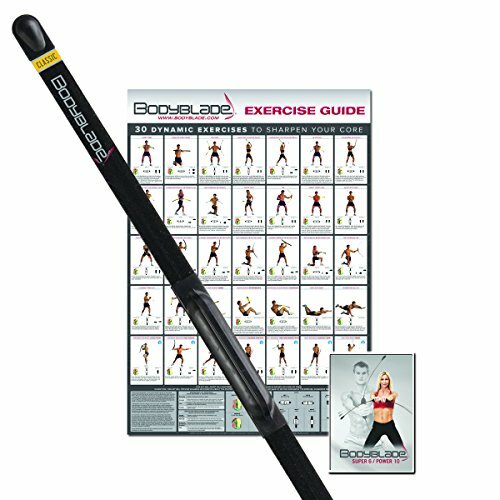 - A great all-around functional training and conditioning tool; 10 minutes a day for a complete strength workout. Enough resistance for performance training yet ideal for active aging and rehab of all adults.